“Never doubt that a small group of thoughtful, committed citizens can change the world. Indeed, it is the only thing that ever has,” goes the famous saying by Margaret Mead. At a time when the world faces an impeding environmental crisis and when the impacts of global warming and climate change are already being felt, there is an urgent need to change the way we are doing things. The world today needs Green Heroes who maybe groups of people or just mortal individuals ready to take up the cause of environmental protection. Indeed many have responded to this call and a Green Change is slowly yet steadily percolating our civilization. It needs to be noted here that the global carbon dioxide concentration has, for the first time in recent times, crossed the 400 parts per million (ppm) mark in 2015. This is alarming since the pre-industrial level carbon dioxide concentration was known to be stable at 280 ppm. The extra concentration of carbon dioxide added to the atmosphere because of industrial development has now resulted in the warming of our planet and making our civilization vulnerable to the disastrous consequences of a changing climate. In this backdrop, it is time to not only take green action, but also encourage, motivate and support those who are already doing something to protect the environment. Realizing this need, Welspun Renewables invited nominations for its ‘Green Heroes’ Project, which is an initiative undertaken in association with The Economic Times Acetech. The ‘Green Heroes’ Project is looking for people who are doing their bit towards a greener, healthier environment. 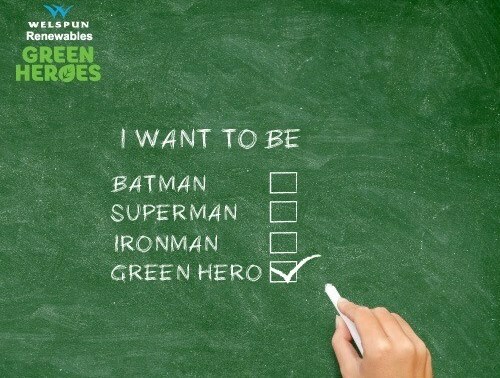 If you are one of them, here’s your chance to be a Green Hero. You can also nominate someone you know who is contributing towards building an eco-friendly environment. The ‘Green Heroes’ project is part of the philosophy of Welspun Renewables, of striving for a greener planet with the belief that everybody has the potential to do something for the environment. Participation is easy and simple. Click here to visit the Welspun Renewables Green Heroes Project website and scroll down to fill the nomination form. You can also visit the Facebook page of the Project by clicking here. So, for ensuring a healthy, clean and green planet make sure you nominate your green initiative or the green initiative of a friend you know. There is no participation fee for this project. Detailed Terms and Conditions of the project can be read here.